Taiwan Ministry of Science and Technology group line up for a photo at the extended Taiwan's Investment Promotion and Marketing Conference in Boston on Sept. 13. 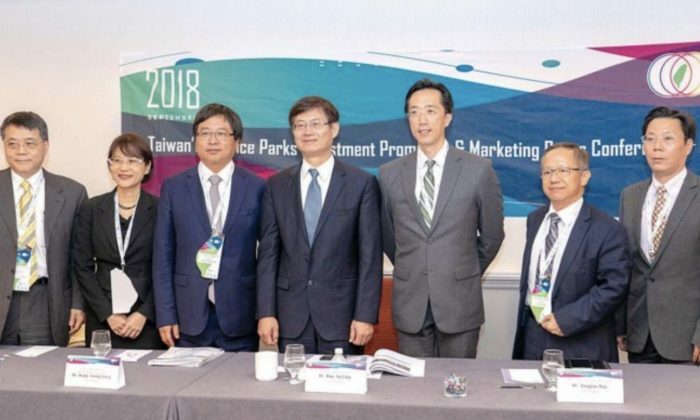 Taiwan’s Ministry of Science and Technology group held an extended investment promotion and marketing conference for its three major science parks: Hsinchu, Central, and Southern science parks at the Hyatt Regency in Boston on Sept. 13. Yu-Chin Hsu, Deputy Minister of Science and Technology, shared experiences with over a hundred guests attending the event. Hsu voiced the current status and future opportunities in both high tech companies and science parks in Taiwan. Hsu and his colleagues from Ministry of Science and Technology was in San Francisco for business on Sept. 7. The party visited several local companies including semiconductors, artificial intelligence, biotechnology, and other enterprises. Hsu mentioned that semiconductors, precision machinery, and biomedicine were the fastest growing industries in Taiwan for the first six months of 2018 – reflecting the developmental trend of the international industry. He believes that Taiwan has a solid manufacturing foundation and expects to attract new companies to develop in Taiwan science parks, such as software, artificial intelligence, big data, and other businesses. Hsu acknowledges Boston as a high-tech center in the US, with top universities and start-ups in artificial intelligence and biomedicine. He also believes that technology must be connected to manufacturers in the future. New technologies are combined with Taiwan’s mainstream and start-up companies, similar to many successful examples in Taiwan in the past. Yeong-Junaq Wang, Director-General of Hsinchu Science Park, expressed his interest in virtual reality technology when he visited Aemass in Silicon Valley. The group hopes that companies specializing in the field will reach out with Taiwanese manufacturers to find more applications for VR/AR technology. Weichen Lin, Director-General of the Southern Science Park, announced the “0th” drone competition to be held next year in Southern Science Park. He intends to gain insight into drone competition in Taiwan before holding world-class competitions in the future. “Our Science Park is most proud of the service,” Wang said. He conveys that the “one-stop service” of the park allows foreign companies to run all procedures in one department, greatly simplifying administrative processes. On the same day, the group invites Dr. Hsiujuan Tsai from Tangsueng Technology Consulting Co., Ltd. to share the presentation entitled “Innovative Development and Opportunities in Taiwan from the US Perspective.” Chengfung Li, co-founder, and chief operating officer of Origin Wireless Intelligent Broadcasting Company, shares his investment experience in the Taiwan Science Parks with guests. Douglas Y. T. Hsu, Director of the Taipei Economic and Cultural Office in Boston, was present to welcome guests. Mark Sullivan, Executive Director of the Massachusetts Trade and Investment Office, also attended the event. He introduced his responsibilities and briefed on the economic state of the Massachusetts industry. Sullivan praised Taiwan as an “excellent” investment location.